The Guest Review: Entertainingly Frustrating | Nerd Much? **We were granted Early Access on Steam to the enigmatic puzzle game The Guest, debut title from fledgling game studio Team Gotham, and have the opportunity to share our thoughts with you. We were thoroughly intrigued by Team Gotham’s vision for this game, and for the most part, they delivered. The Guest is a first-person explorer where the player wakes up in semi-darkness in a run-down hotel room with no preamble or explanation. The atmosphere is delightfully creepy; although not exactly a horror game (nothing will jump out at you, I promise), the design of the room, soundtrack, and player’s total isolation are enough to make the hairs on the back of your neck stand up. This environment, coupled with the impressive graphics, make for a truly immersive experience. Every nook and cranny is brought into sharp focus, enabling you to explore your surroundings thoroughly. You’re able to carefully examine each clue you find from every angle in order to piece together your identity as Doctor Evgueni Leonov, along with some backstory regarding how you came to be in such a predicament. 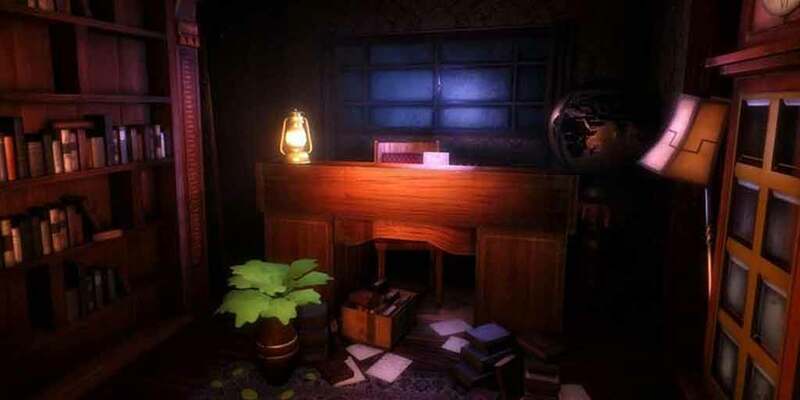 A game that is set entirely in one hotel room has some obvious limitations, but there are plenty of surprises in store as you solve some grueling puzzles and riddles in order to unlock previously-hidden areas. Prepare to be challenged; there were a few puzzles that had me racking my brain to the point where I had to walk away for a while (and I am no stranger to puzzle games). There are a number of objects that you can pick up and add to your inventory; some provide information, some must be combined with other items, some you can use to interact with objects in the environment, and some are useless junk. It’s up to the player to determine which is which. While this is overall an impressive debut title, we do have a few criticisms. As mentioned before, the setting is very self-limiting, so I only got about seven hours of gameplay out of it (a few of those spent pulling out my hair in frustration). While this is made somewhat more reasonable by the $9.99 price tag, we also have to take into account the complete lack of replayability. I’ll also note that I had no hints available; if players resort to the internet for assistance, that time could be cut down significantly. Also, while the puzzles are engaging, the actual plot is rather thin. Doctor Leonov is certainly shrouded in mystery, and you do find minor clues as to what has happened in the outside world in the form of letters and newspaper clippings, but the plot ends there; outside forces are only vaguely alluded to. It’s compelling enough as far as puzzlers go, but as a mystery game, the plot twists and surprise ending felt rather anticlimactic and doesn’t really explain much. All things considered, The Guest is worth the price for an evening or two of intense mental stimulation. Each puzzle is unique and well-crafted, with several that are challenging enough for even the most experienced puzzle-solvers.